Mid-cap and small-cap stocks tend to out-perform large cap stocks in this month (called the January Effect). On average, since 2000 the FTSE 250 Index has outperformed the FTSE 100 by 2.3 percentage points in January – the best out-performance (with February) of all months. Small caps do even better, out-performing the FTSE 100 by an average 3.7 percentage points in the first month. In the last twenty years the sectors that have been strong in December have been: Construction & Materials, Financial Services, and Media; while the weak sectors have been: Beverages, Food & Drug Retailers, and Food Producers. Thursday will be the first trading day (FTD) of January. Since 1984, the FTSE 100 Index has risen on average 0.43% on the January FTD, and has had positive returns on that day in 62% of years. This makes it the fourth strongest month FTD of the year. Since 2000, the performance has been even stronger on the January FTD, with an average return of 0.82% and positive returns in 11 of the past 14 years. A previous post looked at the average FTSE 100 returns on the first five trading years of the year. 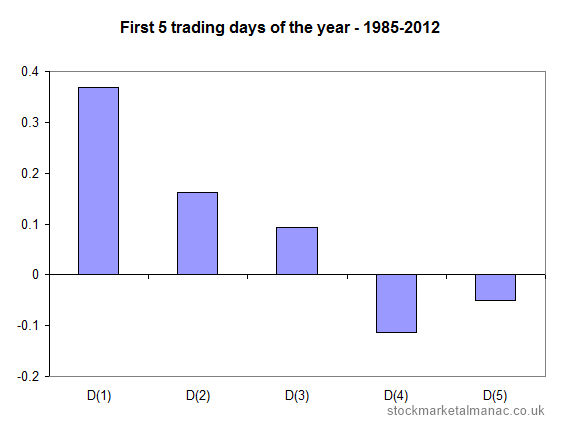 The following chart reproduces the chart from that post – showing the average FTSE 100 returns for the first five trading days of the years 1985-2012. 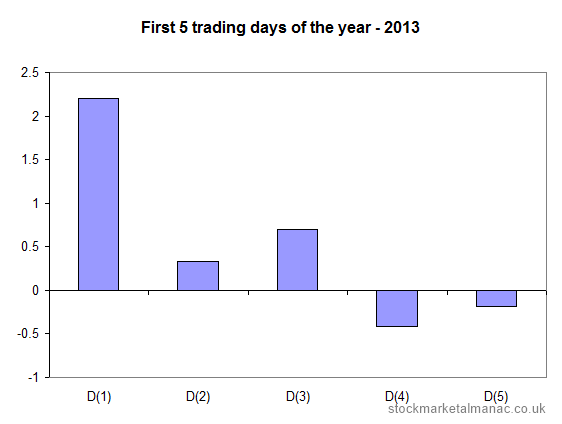 The second chart shows the returns for the first five trading days of 2013. 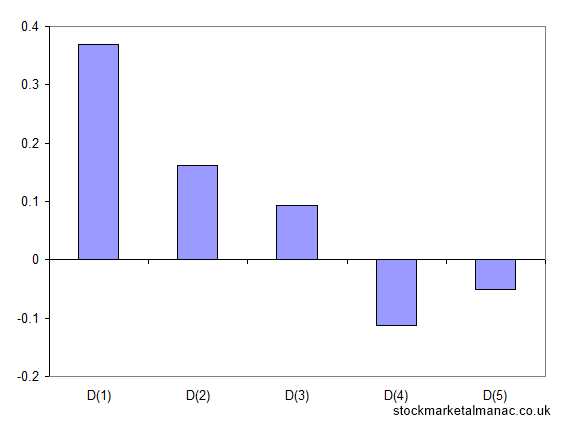 As can be seen, the profile of returns is similar: the first day being the strongest, with returns trailing off after that, and with the 4th and 5th days having negative returns. 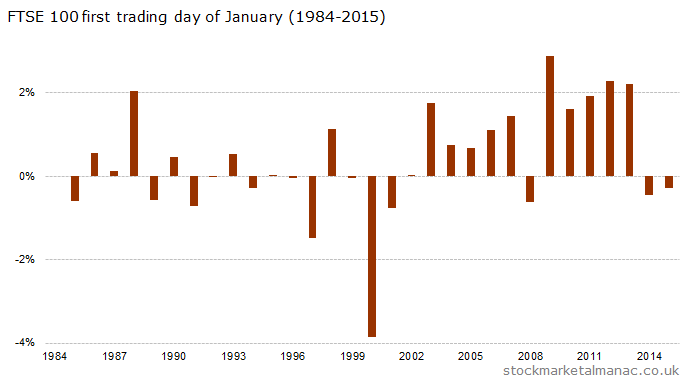 January is a middling month for the stock market. 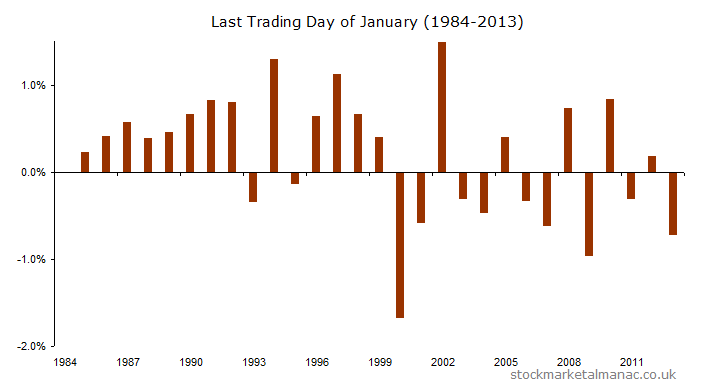 Since 1984 the market has risen in 57% of all years in January, with an average rise of 0.3%. This makes the month eighth in the ranking of monthly performance. Interestingly, it is the month whose performance has changed the most over the last few years – in 2007 the month ranked fourth and has since fallen four places. The accompanying chart plots the average day-by-day performance of the FTSE 100 Index throughout January since 1985. 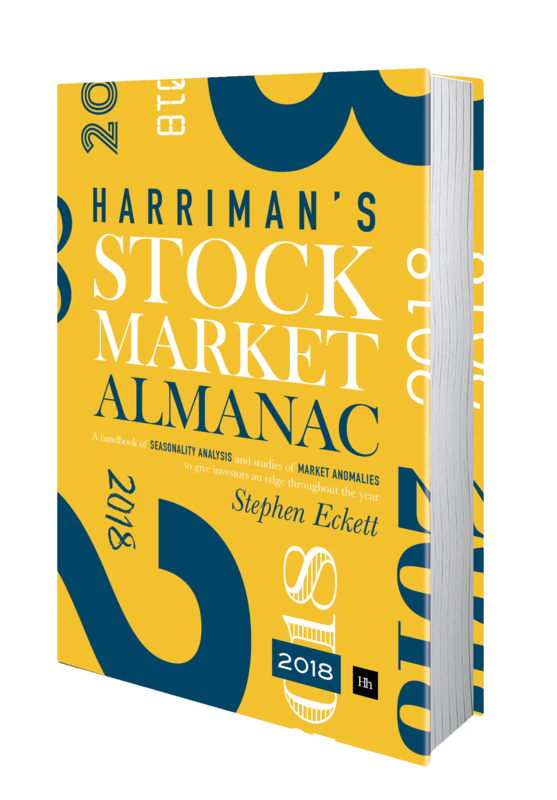 As can be seen, historically the euphoria of December (the strongest month of the year) carries over into the first few days of January as the market continues to climb for the first couple of days. But by around the fourth trading day the exhilaration is wearing off and the market then falls for the next two weeks. 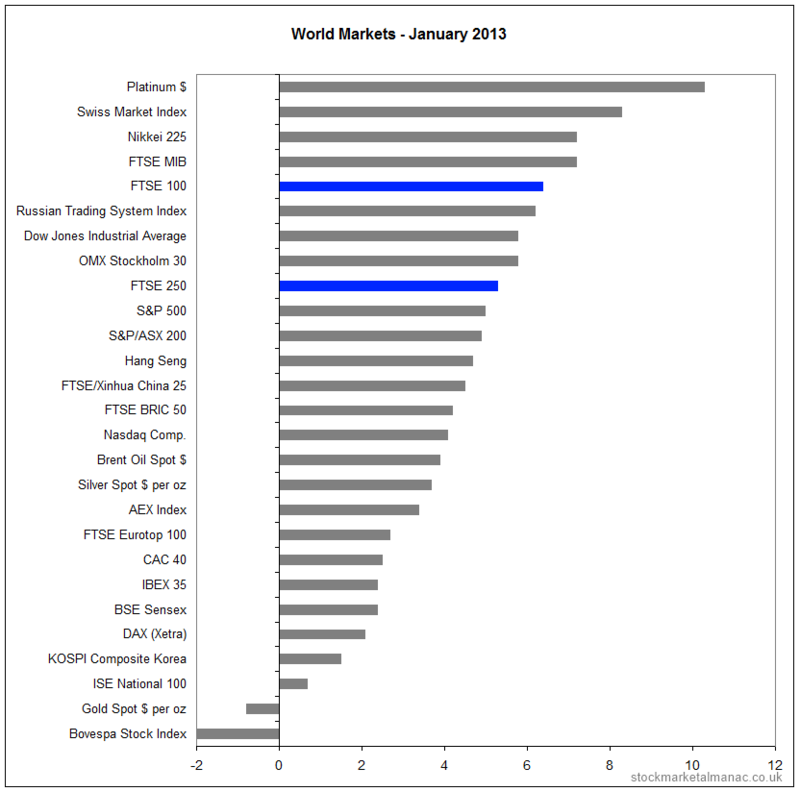 In fact, the second week of January has been the weakest week for the market in the whole year. Then, around the middle of the third week, the market has tended to rebound sharply, and rises to end the month slightly up. 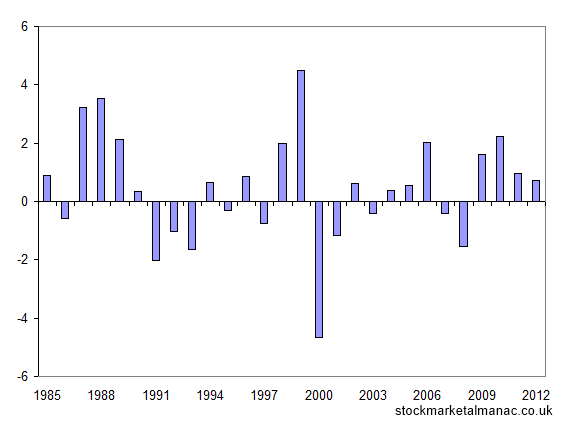 January is part of the strong six months of the year (November-April, the Sell in May effect), but it is the weakest month in this period. The month is better for mid-cap and small-cap stocks. On average, the FTSE 250 Index outperforms the FTSE 100 by 1.6 percentage points in January – the best out-performance (with February) of all months. 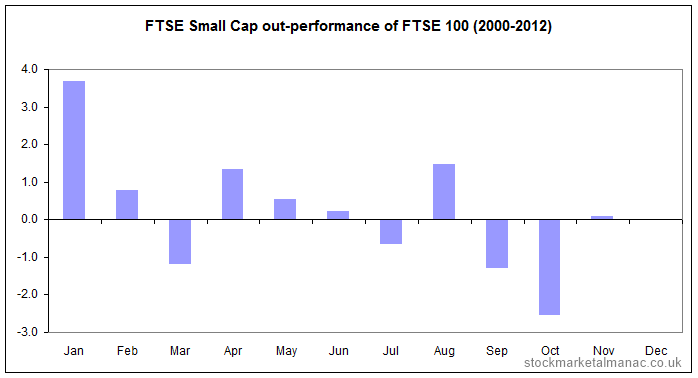 Small caps do even better, out-performing the FTSE 100 Index by on average 3.7 percentage points in the first month. A famous market predictor in the US has it that the direction of the market in the whole year will be the same as that for the first five days of January. Research shows that the same rule works more or less for the UK market as well. Anniversaries for the month are: 18 January will be the 40th anniversary for both Bodycote and Halma who listed on the LSE in 1972, while 29 January will see respectively the 50th and 60th anniversaries of British American Tobacco and Monks Investment Trust listing on the LSE. Dates for the month: 1 January – the LSE closed, 3 January – MPC interest rate announcement at 12 noon, 20 January – inauguration of new (old) US president, 21 January – US market closed (Martin Luther King Day). 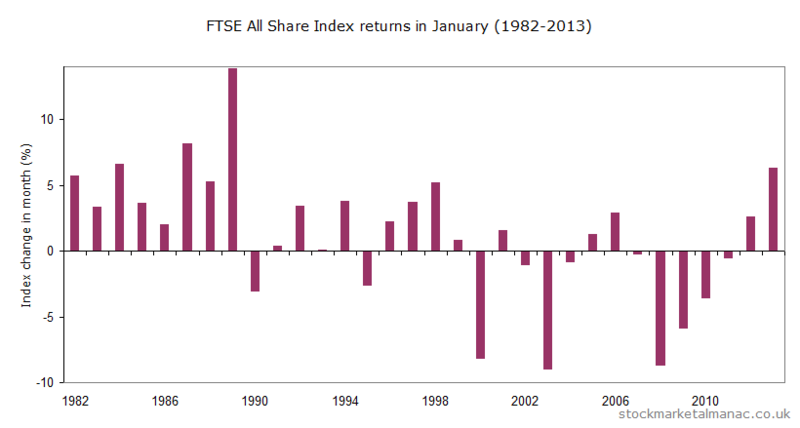 Since 1985 the FTSE 100 Index has increased on average 0.45% over the first five trading days of the new year. The following chart shows the first five days percentage change for all years from 1985. For example, over the first five days of 1985 the index rose 0.89%. The following chart shows the average percentage FTSE 100 Index move for each of the five days in the new year. 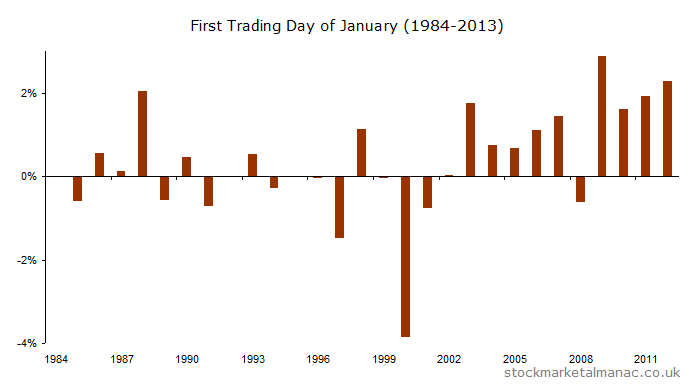 For example, on average since 1985 the index has risen 0.37% on the first trading day of the year.